London may be getting its own version of the High Line park along the River Thames. The team of Erect Architecture and J&L Gibbons landscape architects were chosen in a competition organized by RIBA and Vauxhall One. Their design combines a lush elevated promenade with a series of temporary installations, acting as both a commuting route and cultural attraction for locals and tourists. 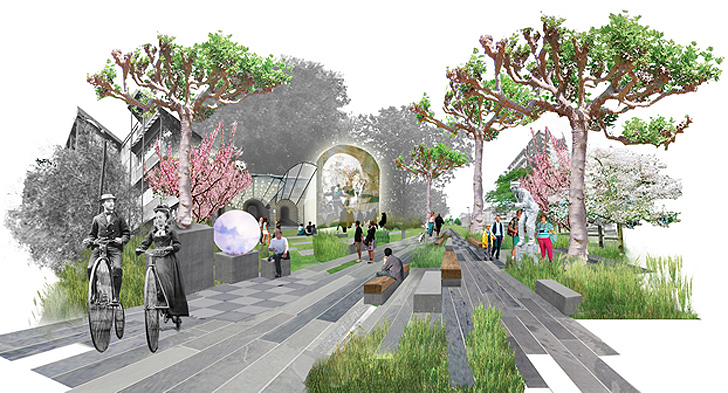 Inspired by the Vauxhall Pleasure Gardens that were open from the mid 1600s-1800s in London, Erect’s promenade would go beyond being just an elevated park like Paris’ Promenade Plantee and delve more into being a hub for nature and creativity. The park, which will stretch along the Nine Elms area of South Bank, will link transportation hubs while providing entertainment and green space. Rain gardens will line the promenade, creating sustainable irrigation for the other plants, while also draining excess water away from the area. Pruned trees will cast a surreal feeling in the midst of flowering gardens, with its contrast adding to the “Cabinet of Curiosities” theme. Temporary and permanent installations will bring rotating art to the public realm, while green space will welcome relaxation, offer meeting points and encourage outdoor exercise. The project will help to renovate the Vauxhall area around the Battersea Power Station, which will soon be turned into mixed-used development and headquarters for the U.S. Embassy.